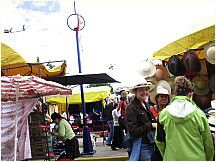 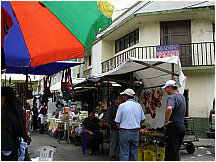 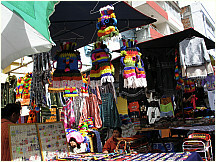 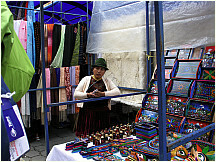 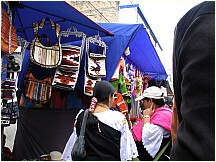 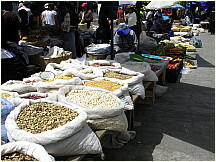 The Otavalo market occupies many blocks in the city center and has become a tourism destination featuring high quality goods at modest prices. 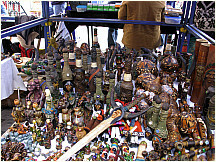 For Europeans with a strong Euro, the prices are downright cheap! 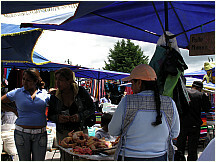 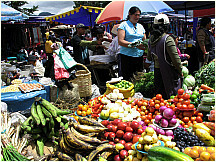 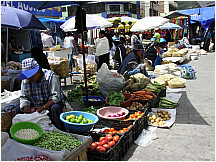 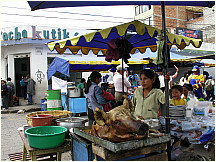 Free pictures of scenes in and around Otavalo Market, Ecuador. 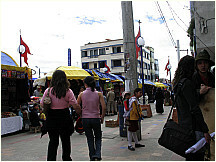 Otavalo City scenes are separate. 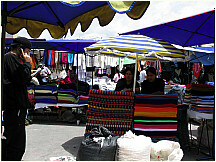 Bright textiles on display at the market in Otavalo, Ecuador. 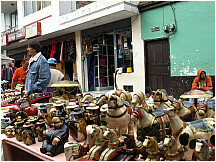 Brightly colored wood carvings on display at the market in Otavalo, Ecuador. 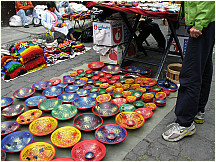 Bright ceramic bowls on display at the market in Otavalo, Ecuador. 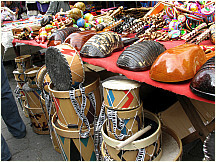 Bright drums and stringed instruments made from local animals on display at the market in Otavalo, Ecuador. 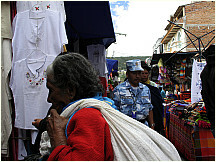 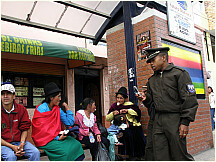 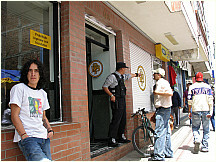 Policeman patrolling the market in Otavalo, Ecuador. 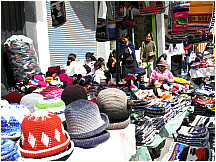 Bright hats and textiles on display at the market in Otavalo, Ecuador. 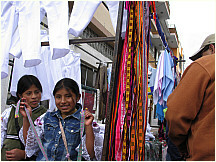 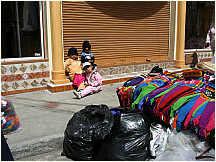 Children hanging out near their mothers' display at the market in Otavalo, Ecuador. 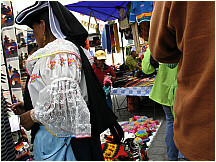 Beautiful clothing worn by indigenous women at the market in Otavalo, Ecuador. 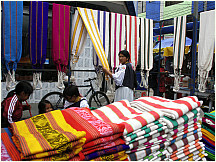 Many carry their blanket on their head for when they need to sit. 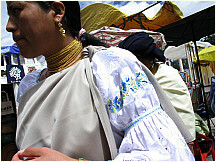 Bright clothing worn by indigenous women at the market in Otavalo, Ecuador. 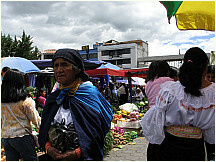 Young girl with a baby on her back, at the market in Otavalo, Ecuador. 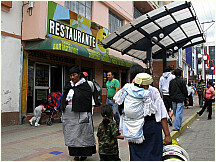 VERY large children are often carried this way. 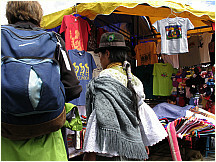 Typical indigenous clothing, complete with a baby on the back, at the market in Otavalo, Ecuador. 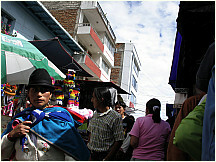 VERY large children are often carried this way. 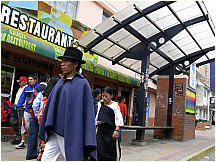 Typical pancho and hat clothing worn by indigenous men at the market in Otavalo, Ecuador. 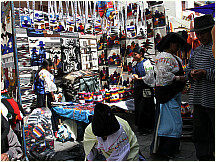 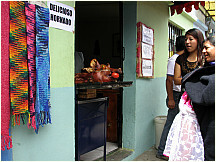 Typical clothing worn by indigenous people at the market in Otavalo, Ecuador. 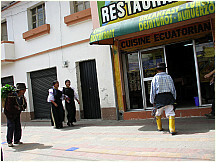 Muck boots are popular in many rural areas. 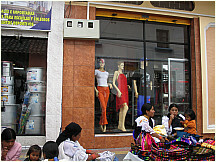 A clash of cultures: manikens of a clothing store stand behind women in typical clothing worn by indigenous people at the market in Otavalo, Ecuador. 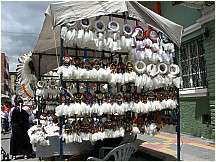 Pots and pans for sale at the market in Otavalo, Ecuador. 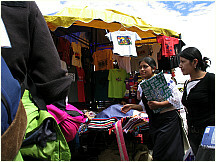 Young vendors of beads and belts at the market in Otavalo, Ecuador. 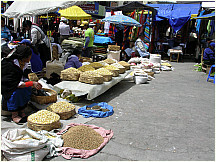 Sea shells and other goods for sale at the market in Otavalo, Ecuador. 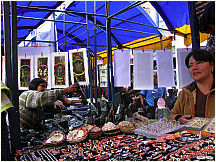 The Incas used beads from these shells as money, similar to that of the Northeast USA Indians. 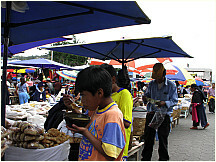 Children eating a mainstay of hot soup at the market in Otavalo, Ecuador. 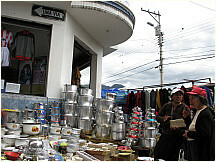 Several vendors have huge pots of different soups.